My holiday trip out to Ontario is rapidly coming to a close. 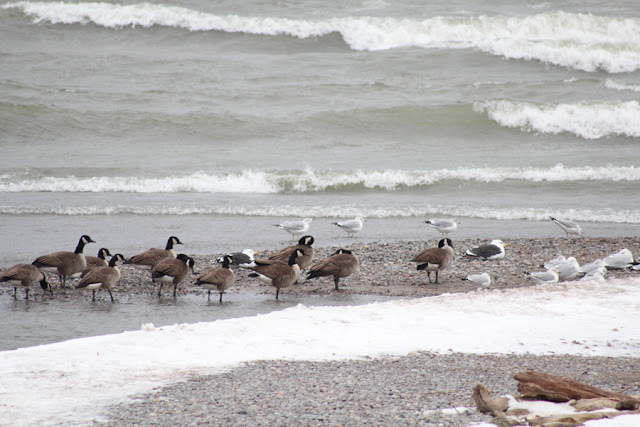 My last update came just before Christmas and since then I have scouted for the Uxbridge Christmas Bird Count (CBC), executed said bird count, had a day out with friends near Burlington, and poked around various areas within half an hour or so of Port Perry. That was all chronological, so I'll just tackle this beast of an update in a similar fashion. The area I was assigned for the Uxbridge CBC was a decent-sized sliver that encompassed the small community of Greenbank, an abundance of agricultural land, and a few patches of forest, including a slim band of the Nonquon Provincial Wildlife Area. On December 24, I coerced Janean to join me for an afternoon run out to scout within my assigned count area. This turned out to be a very productive hour and a half trip. Our random route took us down Spadina Side Rd. to assess whether one of the biggest ponds in my area had open water. It had a wee patch, but no waterfowl. I continued south past the pond and as I neared the T-junction at Cragg Rd., I spotted an intriguing bird on the wire. I said to Janean "That's something different!" We inched up in the car and when I felt the distance was reasonable I raised my binoculars. 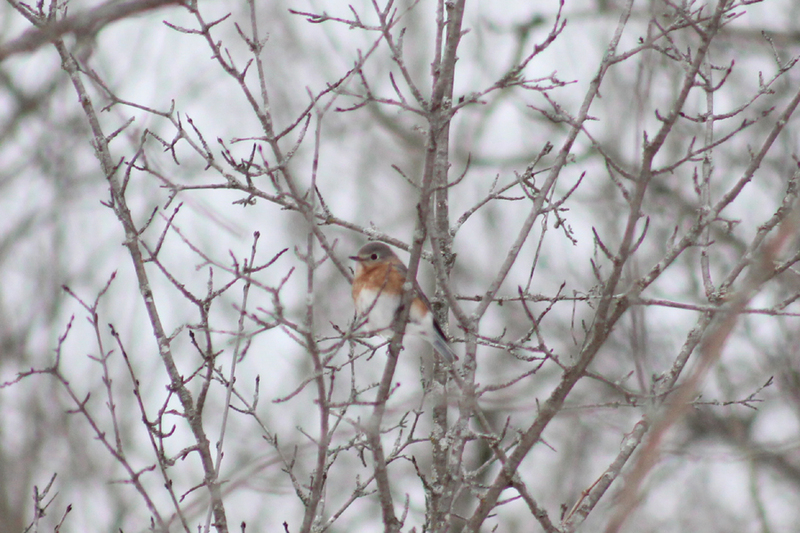 Male Eastern Bluebird (Sialia sialis) - what a great winter bird! Then Janean said there were more. There turned out to be four males and one female. I had read a couple reports of Eastern Bluebirds on the Ontario birding mailing list, but knew they were a relatively scarce bird in the winter. The brilliant azure of these male Eastern Bluebirds really light up a winter day. The two left birds are the males and you can see the drabber, darker tones of the female on the right. The birds stayed at a distance I couldn't quite snap a crisp photo, but this shot shows the female Eastern Bluebird a little closer. The bluebirds flew away to the south after five minutes or so of enjoying them. I hoped they would stay in the area for the count. I headed west on Cragg Rd. and after traveling only 500 metres or so, Janean said she saw a flock of birds flying over the fields. I pulled off to the side of the road and hopped out in hopes of relocating the flock. I managed one brief view and thought they may be Horned Larks (Eremophila alpestris), but they immediately dropped back out of view. I had decided to give up on getting a good view and got back in the car. Naturally, I spotted the flock again and had to get back out and this time I brought the scope. I managed to scan over the flock with the scope and could see I had indeed seen Horned Larks. Among the approximately 40 Horned Larks were 25 Snow Buntings (Plectrophenax nivalis) and, after a lengthy scan, 2 Lapland Longspurs (Calcarius lapponicus) as well. The latter seems to be a fairly hard bird to come across in the winter here and again I hoped to relocate these birds on count day. I was cold and it was starting to get towards dusk, so I called it a day. I was amazed at how successful the short scouting trip went and had high hopes for the count. Fast forward to the Uxbridge CBC on December 27, Janean and I met our co-worker, Stephanie, at around 7:15 a.m. and headed out in the snow for the count. A winter storm had rolled in over night and dropped a few inches of snow and Stephanie offered up her truck as the vehicle of choice for the count. I immediately felt this was the right choice as we watched a car go in the ditch shortly after leaving! We decided to start in the community of Greenbank by walking the residential area in hopes of finding activity around feeders. The birds were few and far between for the first 20 minutes or so, but we eventually spotted several Blue Jays (Cyanocitta cristata) and some Dark-eyed Juncos (Junco hyemalis). We marched over to the activity and it turned out to be quite the spot! 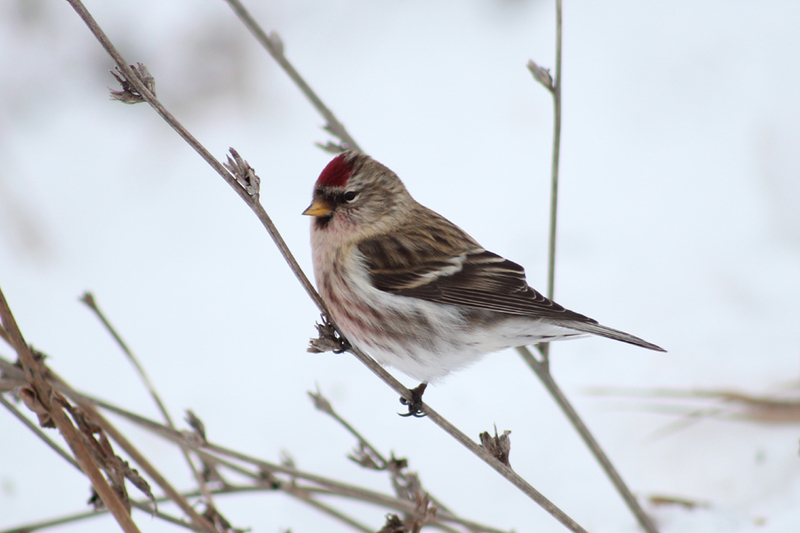 I was rapidly adding species and bumping up numbers... American Tree Sparrows (Spizella arborea) in the shrubs, a couple Common Redpolls (Carduelis flammea) in the trees, a Downy Woodpecker (Picoides pubescens) behind one of the houses, and what's that noise behind me? I wheeled around to inspect the unfamiliar sound and was thrilled to see a male Red-bellied Woodpecker (Melanerpes carolinus) at the top of a telephone pole! 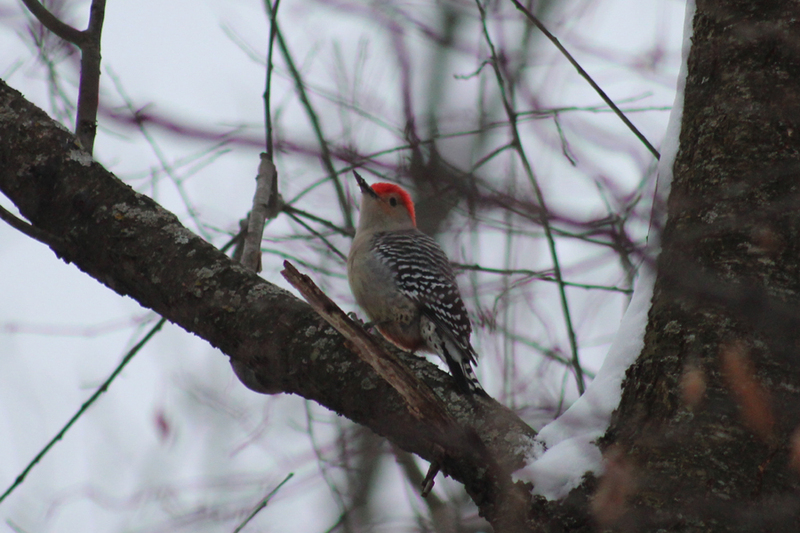 As I was excitedly telling Janean and Stephanie that it was my first sighting of Red-bellied Woodpecker in Canada, a lady popped out and told us she was recording birds at her feeder for the count. I was kind of deflated because I figured that might be our best bird of the count, but as long as it was documented I was happy. 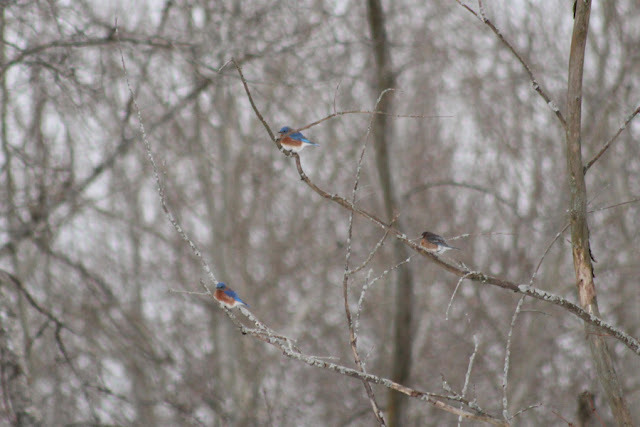 We moved on to see if the Eastern Bluebirds were back at the same spot and struck out. Similarly, we couldn't find the mixed bunting-lark-longspur flock. The first half of the day was really just tallying as many of the expected winter species as possible, but we finally snagged a decent bird. Unfortunately, this bird was just in another group's area. We were travelling north on Marsh Hill Rd. to get to the easternmost stretch of Blue Mountain Rd. and the first house on the latter road had a nice feeder and a good deal of activity. I knew it was in the other group's count area but I made a decision to record the birds separately in case the adjacent group didn't have a chance to check it out. As I pored over the sparrows, I spotted an adult White-crowned Sparrow in a shrub beside the driveway. We checked the count list and saw it was not recorded before, so I snapped a couple record shots. It is not really that rare, but it is another low density winter bird. 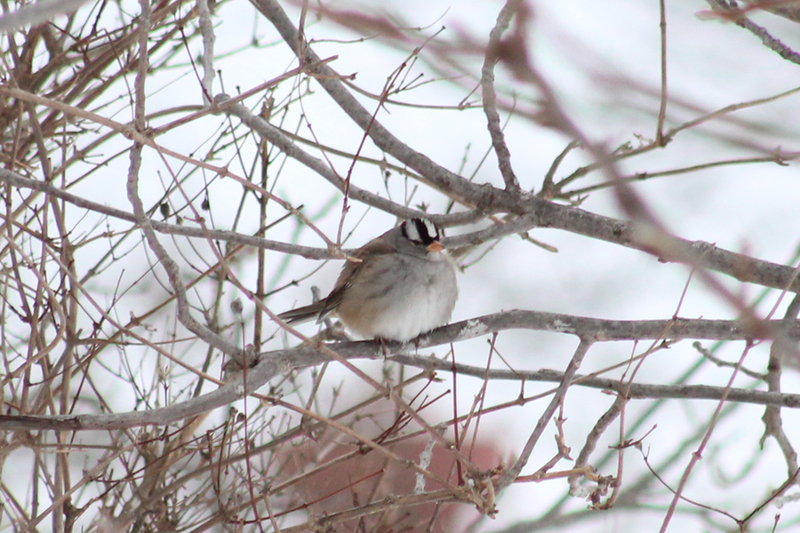 When birds are really diagnostic like a White-crowned Sparrow, it doesn't matter how lousy the record shot turns out. This is not too shabby, though. We broke for a quick lunch after Blue Mountain Rd. and then continued tallying the expected winter species, including a lovely sighting of an approachable Common Redpoll right beside the road. This Common Redpoll was eating seeds from what appears to be Chicory (Cichorium intybus), which I think made a very attractive perch. It wasn't until just after 2:30 p.m. that we lucked into another interesting bird. Coming from the west, this is not very novel to me but I knew it was a decent find for the count. I believe we were travelling to the dead end portion of 1 Line when I noted a large bird circling overhead - a sub-adult Bald Eagle (Haliaeetus leucocephalus)! Luckily a Bald Eagle is pretty easy to identify because birds in flight in dull light are not my forte! That was it for big highlights over the course of count day. I had a great day participating in the Uxbridge CBC and I appreciate all of Derek Connelly's count coordination efforts. The Uxbridge contingent really strive to make the count welcoming and user friendly, which was great for an out-of-province birder like me. The most impressive feature was a laminated map produced in a GIS with my count area's boundary set over satellite imagery. Brilliant! I hope to be back in future years and next time I will do my best to make the post-count wrap-up to meet some of the folks behind the magic. Moving along to the third-to-last day of 2012, Janean and I headed to downtown Toronto with two of her best friends to visit the Royal Ontario Museum. After several hours of looking at gemstones, dinosaur bones, mosaics, pottery, Art Deco designs, armour, and taxidermied specimens, Janean and I hopped on the GO Train to Burlington to meet up with a different set of friends. We stayed up to the wee hours, got some sleep at their place, had breakfast, and then went for a great walk at the Royal Botanical Gardens near Hamilton. I kept my eyes peeled for different birds on the way to the gardens and the best sighting was a Northern Mockingbird (Mimus polyglottos). The Royal Botanical Gardens seemed like Hamilton's terrestrial version of southern Vancouver Island's Esquimalt Lagoon or Beacon Hill Park. 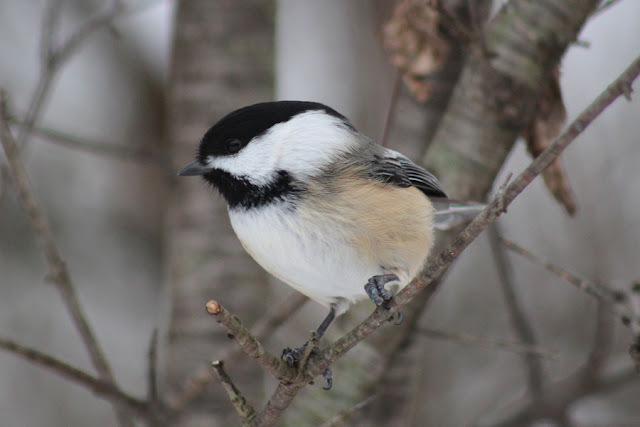 Several informal feeding stations are set up and we encountered fellow walkers that brought along bird seed to entice the Black-capped Chickadees (Poecile atricapillus). Black-capped Chickadees that are fed during the winter are almost too friendly! Rather than go into excruciating detail, I will just skip ahead to the best feeding station which was near Cootes Paradise wetland area. 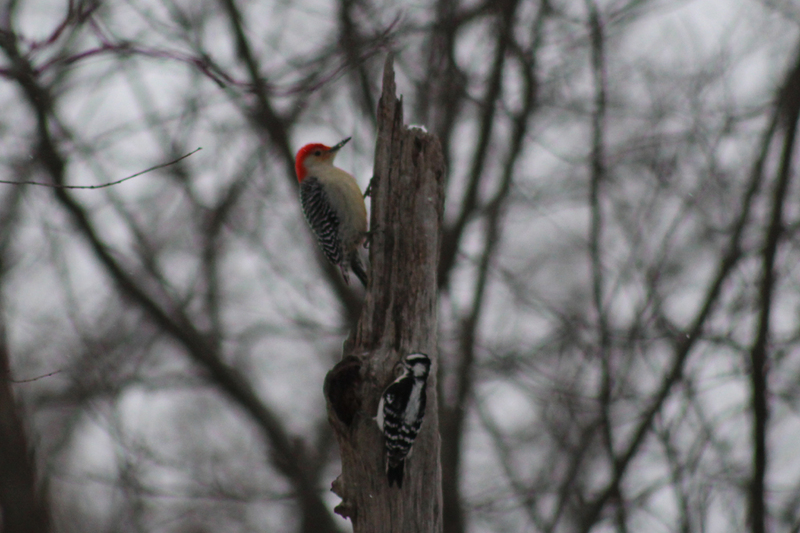 As I approached the flurry of activity, a mid-sized woodpecker flew up and I was pleased to see it was a Red-bellied! I luckily had my camera ready for a record shot this time. You can just see a touch of the namesake red belly of this Red-bellied Woodpecker at the Royal Botanical Gardens. Birds of a feather flock together! I watched as a Downy Woodpecker crept up the same snag and momentarily was in the same view as the Red-bellied. Aside from the woodpeckers, I enjoyed great looks at several White-breasted Nuthatches (Sitta carolinensis) and Northern Cardinals (Cardinalis cardinalis) despite their lack of cooperation for photos. I would definitely enjoy visiting this area again in the spring or summer - it had a great mix of wetlands, mature and regenerating forests, meadows, and shrubs. I think it would be a playground for an all-around naturalist! This definitely is getting lengthy, so I'll try to cap it off with a couple other highlights from New Year outings within a relatively short distance of Port Perry. On January 1, Janean was down and out with food poisoning - Happy New Year! Maybe her resolution was to cook chicken less this year? Anyways, I headed out south of Port Perry and wove my way through a random network of streets looking for flocks of sparrows. That seems to work out here. 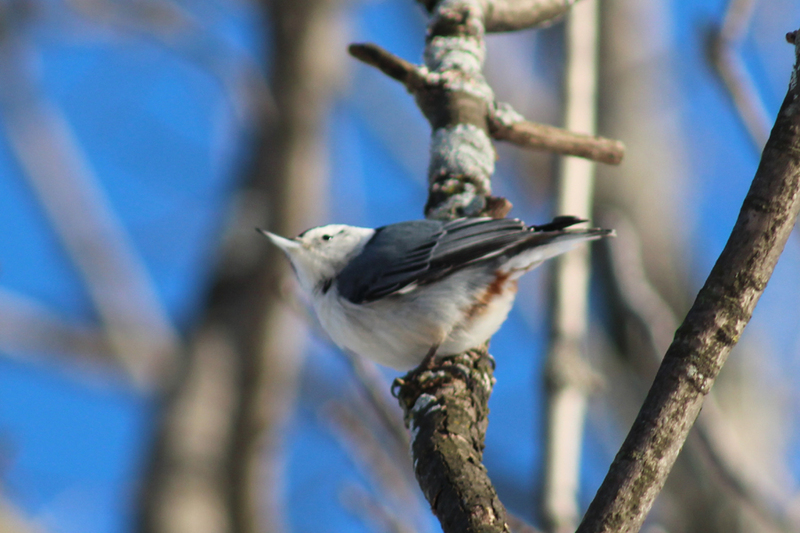 My first patch of activity was comprised of Dark-eyed Juncos, American Tree Sparrows, a handful of Common Redpolls, and a lone White-breasted Nuthatch that nearly cooperated for a decent photo. I didn't say I was unable to obtain a photo of the White-breasted Nuthatch... I just wasn't pleased with the results! I stopped near the corner of Townline Rd. and Duffs Rd. to sift through a flock of Dark-eyed Juncos and heard a familiar call that resulted in a momentary memory lapse. I managed to spot the source - a bulky finch-like bird, which was soon joined by several others. They landed in nearby conifers and then it snapped into place: Pine Grosbeaks (Pinicola enucleator)! When the flock put up again, I counted a total of 16 in the flock. An hour or so later, I passed a tree farm just south of Myrtle that I had been hoping to check out because I could see a row of fruiting trees. I saw birds in said trees, so I pulled off to the side and got out the scope. More Pine Grosbeaks! There was 36 of them gorging on the fruits (perhaps small apples), along with a lone Cedar Waxwing (Bombycilla cedrorum). On January 5, Janean and I first headed south to Whitby Harbour, but decided to venture to new territory further west in Ajax. This led us to Rotary Park where we took a short meander along the Waterfront Trail. Scanning out into the choppy waters of Lake Ontario, I spotted a couple flocks of Greater Scaup (Aythya marila) interspersed with Long-tailed Ducks (Clangula hyemalis). I was more interested in the gull flock on the shore, so we ventured on to get better looks. I saw exactly what I was hoping to see. Those two large, dark-backed gulls are Great Black-backed Gulls (Larus marinus), which maintain a high level of novelty to this westerner! Gulls are always going to be a worthwhile time investment for a birder in the Pacific Northwest, so I always value my time with species that we don't see in the west. Great Black-backed Gull is one of those species that could show up one day and I want to be ready. 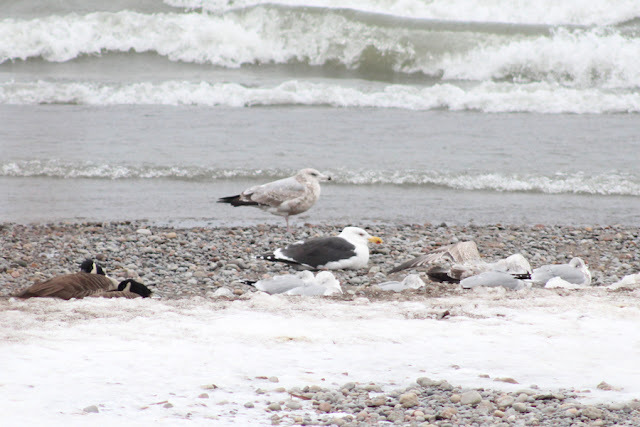 Here's a slightly better view of the Great Black-backed Gull with an American Herring Gull (L. smithsonianus) behind and Ring-billed Gulls (L. delawarensis) in front. 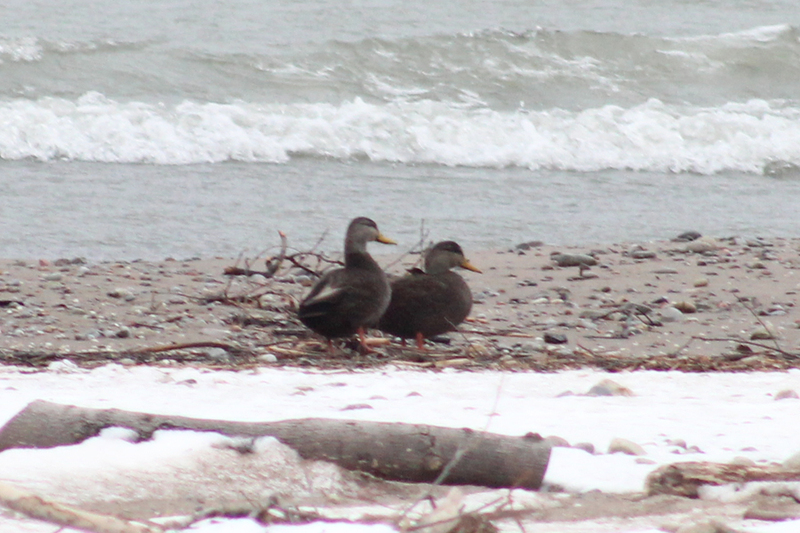 Also out near the gulls were a couple of American Black Ducks (Anas rubripes) or whatever people want to claim these birds are after diluting their genes with Mallards (A. platyrhynchos). Well... if they're not American Black Ducks, they're sure reminiscent of them! The walk ended with a pair of Northern Cardinals and the male did not really want to cooperate, but I opted to document the event anyways. 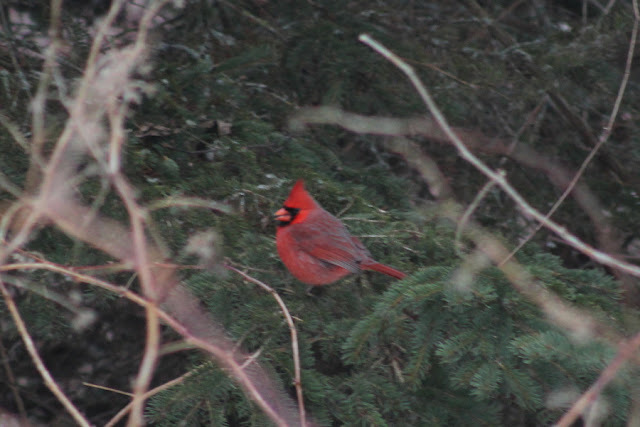 I've seen dozens of Northern Cardinals during my visit, but not a single one has really cooperated for a nice photo. Maybe next time? That about sums up my Ontario winter bird sightings. I have been entering my outings into eBird and apparently I have tallied more than 50 species since I arrived in mid-December. That's not too shabby considering my minimal effort around Lake Ontario. I may pick up another species or two before leaving on Wednesday, but it will take something special for me to update again. If it's just the usual winter suspects here, my next update will have a coastal flavour. I'm looking forward to getting back and trying to hunt down White-winged Crossbill (Loxia leucoptera), Bohemian Waxwing (Bombycilla garrulus), and Brambling (Fringilla montifringilla) on southern Vancouver Island. These species have been putting in appearances on the Lower Mainland, so I think it's time to turn one up on the Island!